Agricultural extension work -- Florida. Agriculture -- Florida -- Experimentation. Agriculture -- Study and teaching -- Florida. University of Florida. Agricultural Experiment Station. 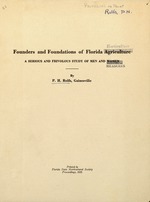 A lecture, "Founders and Foundations of Florida Horticulture: A Serious and Frivolous Study of Men and Measures," given by P. H. Rolfs to the Florida State Horticultural Society,1935. N.B. This article was not proo.f-read by the writer.-P. H. R.
FOUNDERS AND FOUNDATIONS OF FLORIDA A..
much as I did preparing it. B. M. Hampton, New Port Richey; (8) W. S.
(11) John B. Oberholzer, Esmeralda; (12) L. B. (15) W. D. Yonally, Grand Island. two others should have been included. ida Horticulture. They are: F. V. Coville, R. H.
Dorsett, David Fairchild, B. T. Galloway, L. 0. P. H. Rolfs, William A. Taylor and H. 3.
und ing monument in the introduction of thou-. unit on which investigation should be centered. ical work, opposed the co-operative ideal and won. splendid work in their own way, for Florida. Hume and Florida Horticulture are synonymous. nical descriptions of numerous of our fruits. ceedings and other contemporary publications. iniscence of forty years in Florida Horticulture. Secretary Floyd asked for it: So here it goes. tions in securing the presence of winter visitors. to the Ponce de Leon; to the Royal Poincianna. spiring. The delicious perfume of the bloom. Lord created the orange tree, He called it a day. He has not attempted to improve on it. dren grown old, play with broken toys." periods: (1) B. C. (Before Coming); (2) A. D.
(B. C.) ended in 1891. Industry and the Florida Agricultural College. hundred men and women employed in Florida. latter group that we will pass in review tonight. years ago. Adams, Rev. Lyman Phelps and W. S.
'but basically remained pragmatic. Dudley W.
ogy and by myself for the Experiment Station. peach orchard were quite free from the scale. terion. (The Hilgard tests for soil fertility). "A" grade in a large class of theorists. something in it. One never can tell. and grapefruit and got properly "sat down on." He went home and published his own horticulture. Now in April, 1935, comes the surprise. Prof.
does cause a citrus disease. Prove all things! easily subdued by the transportation interests. petes on the European markets with all comers. that he was running true to form. his physical and social environment. became luminous and then faded. Not these. present pests in the whole tropical plant world! President of the National Audubon Societies; Dr.
ried this knowledge to-the Manatee. Dr. J. C.
and fruiting. Climate and soil are favorable. if not determining factors, on-our Horticulture. tuists as cominIg from the individualistic East. did not exist. A sympathetic Republican U. S.
truck and tropical fruit growing into the doldrums. an able Florida Horticulturist to the tropic isles. lieved this situation to some extent. ing an excellent success of the same crop. Why? clearer understanding of the "mass behavior." as a Society, "pull a chestnut out of the fire." complex" has often been an inhibiting factor. of a numerous progeny of atmospheric boosters. from the transportation company, by the court. matter could be smoothed out by making the Rev. ing in scientific training and practical experience. Dr. Pickell and Col. Whitner. yet some good agricultural men, like Dr. A. L.
and so killed himself licking the other fellow. phone" inflicted a mortal wound. Gwynn of Sanford, Dr. Stringer of Brooksville. curred by the enactment of the Buckman Bill. anny, industries and communities were suffocated. of the time in which he lived. raise a family of worthy sons and fine daughters. it came to him by inheritance and home training. growers. The Bureau of Plant Industry, B. T.
We missed a good bet when we passed up G.
GAITSKILL, S. H. After the '94-'95 disaster, S.
dant bloom and to hold the newly set fruit. was a good citrus producing region. him utter an unkind word about others. tanks for the lycimeter at the Experiment Station. Painter settled up in favor of the truck grower. Land. Jacksonville was the logical headquarters. grew into the E. 0. Painter Printing Company." it as a life's ambition fulfilled. promised to meet Adams and write them up fully. trated by stereopticon. That clinched the matter. ers were not pleased. It had cramped their style. and assemble them. He offers to do this charging. ings that have come to hand. The Ethelwvold episode is completely forgotten. '90's we were suffering from "over-production." tinent, lost itself in the wilds of Mexico and Cuba. industry was thrown into confusion. Horticultural Society of a profound stimulus. standstill without either state or Federal funds. would have to be overcome. and write without "where-ases," "afore-saids"
the prosperity of the state. dition to his acceptance of the commissionship. be there when he was needed. found a daughter in Portugal, living near penury. make a prize winning romance. be grown in Florida and especially not at Hastings. to pay for sociological advantages. as the motivating figure. Fate decreed otherwise. graced (?) truck growing by becoming a banker. obliging, but almost painfully reticent. Mr. Alfred Dickinson, at Bonita Springs. F. D.
simmee shipped delicious Peen-toos in the nineties. Godby originated varieties that had special merit. peach nurseries were the more extensive. Plank, and Stubbs took leading parts. them smothered a promising industry. for a price that assured a profit to themselves. fruit has never attained the popularity it deserved. preciated by but few. At one time it was recom-. the market, even in Gainesville. find a lucrative market in Florida. could be made to supply a large local demand. tributor of Godby and Waldo peaches. growing in Florida. Reticent, almost a recluse. HEALY, G. P. The Bald Eagle from Volusia. he was getting so small a price for the fungus. has nearly disappeared from our vocabulary. the "fungus enemies of scale insects, the better." price of some insecticides and spraying machinery. ida Society at the time of our Pensacola meeting. have profited from him more than you realize. mation by the rank and file of the rural people. that distant land from which no visitor returns. Station field operations of spraying. fused permission. We had left him until the last. insects present because that was in our minds. his orchard, the malignant spell would disappear. none and marketed no peaches. TABER, GEORGE L. A "down Easterner." first in 1892; reticent but genial. He "inspired"
Hume to write "Citrus Fruits and Their Culture." The pecan is unique in Florida Horticulture. pression, but the tree keeps on serving its owner. absolute resistant to any insect pest or disease. can now be catlogued as a domesticated species. why Brown said nothing more about taproots. has some seedlings from the Brown trees. chased at Grand Island in 1893, I think it was. grape game. Then there was a "diminuendo." Mr. Ingram and John B. Beach had an "extensive"
before, had planted some near their habitations. having "the largest pineapple field in the world,"
two hundred sixty acres, in one unbroken tract. Mr. Mathis controlled the largest portion of it. Raton got a carload from the Hawaiian Islands. prices produced heavy crops and lucrative returns. ers "lost their heads" and invested in "choice lots"
River. He had an almost year-round income. was considerable income from marketing slips. wealthy as a business man in Miami. stuck it out to his last in pineapple growing. switched over to citrus and went into law. make a pineapple habitat. It failed. a large number of varieties by hand pollination. decade. Some of them were of superior quality. citrus and pineapples is of relatively recent origin. The principal propagators are alive and "live ones." At the beginning of the present century, Geo. bourne, in the early '90's, had a hundred per cent. P. J. WESTER was a day laborer at Palm Beach. knowledge or plants. Some of his best "stunts"
thize with one that was not '"appy." mango trees in the Dade County section. as 1889 he was quoted as an authority on foot-rot. Avenue, about fifty feet from the old stone fence. place at Pinellas by hunting plume birds. each with a skirt of kumquats. arid fifty foot spread. Probably a West Indian. tion and sometimes initiating mischief. correct such defects as dieback, scale insects, etc. mocks as being nature's teaching. the idea that "Angulula" was the cause of blight. Bean was not enamoured with us young fellows. portant now than in those days. politics, law and a premature demise. "Aleuroade citri"; no longer said "gopher-apple,"
-people will know that you are highly educated. to the entomologist at the Experiment Station. trolled the cottony cushion scale. was done in Marion County. rather prominent remedy for a multitude of evils. spray. Some denounced it as ruining their fruit. want of funds and strength he is unable to do so. guided by this book." (p. 8). home and published his own "proceedings." was complete. The rest was up to the farmers. but is not synonymous with it. McRae, Commissioner of Agriculture, and W. C.
move the pieces on the board, to win the game. a more reliable test for ripeness than any other. tation. A public meeting was necessary. A. M.
proved to be the final clincher. our Society were timely and worth-the-while. remained remunerative to the end of his days. letters recorded in the Marion County court house. me twice, that is my fault." to the laboratories of the Experiment Station. dig up the information that he needed. ings if we persisted in calling upon him to speak. was of the same mind still. tilize an extensive grove. Result, the adage. "Hauling muck is a harmless amusement." completely defoliated. Results, negative. Dr.
4. Producing a citrus grove in a piney woods. not have believed it without seeing it. growers. Really a one-week laboratory course. five in the afternoon with two hours for lunch. cultural scientists. The Seminar ideal. developed faster than the scientist. headquarters at the Magnolia Hotel in Leesburg. naturally r looked up to him as as an old-timer. in Germany was the omnipresent "Verbotem." moved out of the state. erous. His principal, a Rhode Islander, I believe. were a gastronomic treat and a delight to the eye. respects, sent out fruit that topped the market. for emergencies that arose or that might arise. on the Board of Control and on the Plant Board. judgment determined the actions of these Boards. names and movements that are all but forgotten. plete in reminiscences, anecdotes and, I hope, data. and public weal; selfish men for private gain. and other Citrus Fruits as Grown in Florida. Ashmead Bros., Jacksonville, Fla., 1888.
has been 'reduced. to something like system." the emulsifying of kerosene with milk. in Florida and How to Raise Them. 1886; 125 pps. Also author of several novels. devoted to orange culture. These are by E. H.
dismissed citrus with three pages. II. Booxs WITH BIBLIOGRAPHIC REFERENCE LISTS. ture." The American Nut Culture Journal, 1906. 159 pages, 38 illus. Bibliography on pps. 153-155. pgs., 124 illus. Bibliography on pps. 555-560.
free to all citizens of the State of Florida. (a). Bulletins from Bureau of Plant Industry. (b). Bulletins from Bureau of Entomology. (c). Bulletins from Bureau of Chemistry. (d). Bulletins from other Bureaus. would present a vivid picture of facts and fancies. plete record of horticultural progress in Florida.